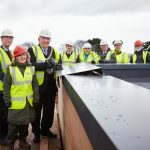 Prior to the Topping-Out ceremony at new primary school on former MOD Ensleigh site, Bath. 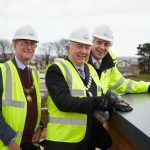 Cllr Patrick Anketell-Jones – Councillor for Lansdown Ward, BANES (far left). 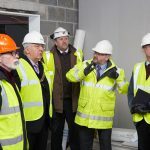 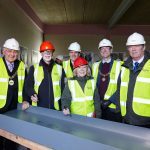 Cllr Alan Hale – Chairman, BANES (2nd from left) and Cllr Paul Crossley – Mayor of Bath (far right) are shown around the new building by Simon Carter (centre) and Neil Spurway (2nd from right) of Rydon Construction. 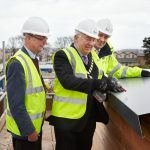 Prior to the Topping-Out ceremony at new primary school on former MOD Ensleigh site, Bath. 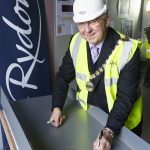 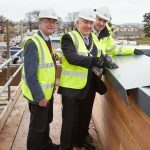 Cllr Alan Hale – Chairman, BANES (left) and Cllr Paul Crossley – Mayor of Bath (right) are shown around the new building by Neil Spurway, Contracts Manaager for Rydon Construction.